Normally I post information about stuff Corel Painter or Wacom Tablet related, as well as tutorials on how to do stuff. Well, today, I thought you might be interested in seeing what leads up to a post about how to do stuff. Confused? Me too. I am saying that before a post, I have to do a lot of paintings. Some are successful and others not so successful; it is all part of the process. During this preliminary painting, I am making brushes and tweaking the process. If you have followed the blog, then you know I love Asian style paintings, especially Chinese brush work and Japanese Sumi-e. I’ve never been trained in either, just read a few books, watched a lot of You Tube tutorials, and practiced myself. I have to admit that I love the practice. I find it relaxing. But, I’m sure working digitally is vastly different in feeling from working traditionally. And please, I don’t want to get into a discussion on the pros and cons of working traditionally versus digitally. For me, they are two different media and really are not comparable. Both are equally valid and creative. I do find it interesting that I cannot find folks working in this style digitally. Recently I discovered the work of Gao Xingjian, who according to Wikipedia “is a Chinese émigré novelist, playwright, and critic who in 2000 was awarded the Nobel Prize for Literature “for an oeuvre of universal validity, bitter insights and linguistic ingenuity.” I do not know anything about his writing; I discovered his traditional visual art. Do take a look at Gao Xingjian on Artnet or google the images of Gao Xingjian. I cannot describe his work, or at least, I cannot describe his work in a way that does it justice. It is contemplative, and that is what I do when looking at his work. I sit quietly with my thoughts and enjoy. With the work of Gao Xingjian as my inspiration, I tried my hand at digital ink or watercolor washes. The first image isn’t like his work at all; I was just trying out a few brushes and looking at the way the media flowed. I was using some of my custom brushes. I already knew how they behave when working in my normal manner, but now I am looking for a different look and feel from the same brushes. I am not sure that makes sense. In one case, I am looking at how the paint flows and blends together smoothly, but in another painting I am looking for the flow to crash into paint already applied and disrupt it, not blend with it. The action is at first accidental, but with practice is controllable. The first image isn’t complete…it is a simple sketch that was never meant to be seen, but I am going to show it. I may regret this, but here goes. Quick sketch testing brushes in Corel Painter 2015. I called it the Stalk. I liked the grainy quality of the variant and the way the paper affects its flow. Stylistically, I was not showing much influence by Gao Xingjian. I tried again, but I turned my paper horizontally. I went wild. I tried multiple brushes, I splashed, I scratched, I played, and I got this. I loved areas of the image, but it disappointed overall. It seemed scattered and too busy. My next attempt was very different. I changed my paper to one of my suminagashi papers that I used in the post Corel Painter X3 SP1, New Flower Brushes…Loads of Fun. The landscape that unfolded surprised me, and I wish I had left it alone, but I didn’t. I decided to add a tree and a bit of grass, which I do not think works. Horizontal Landscape 3 started out nicely. I liked the mountain landscape, which I made with 2 strokes, but alas…it seemed too simple and I had to add the bamboo, which did not help. I added a signature chop and supposedly my name. The chop I designed and for my name, I found a web site that would create the calligraphy. At this point, I must tell you, that these paintings represent the paintings that I saved, there were many more deleted attempts. In the next attempt, I did not add anything and left the first wash alone. I allowed the paint to flow into different paper textures and I used wetter brushes to disrupt areas. I thought Hanging Landscape represented my first success. I took another look at Gao Xingjian’s work and compared it to mine. That was a laugh. I had none of the power, emotions, or strength showing in his work. But, I had to let that go. I just needed to plug along…after all, his work was my inspiration, I wasn’t trying to copy him. I hoped I would develop something of my own from this exercise. I decided to go back to the vertical format and work with the concept of a tree from the beginning. I had added trees as an after thought instead of making them part of the original idea of the painting. I did two quick attempts with trees as the original idea. I liked the background of Tall Dark Tree, but the tree, itself, seemed too much. I tried again, but I kept the tree small. I wasn’t pleased with the overall composition of Tall Pine with Mountain Hint, but I was getting stoked by the watercolor effects. I especially liked the area at the base of the trees that is running. That is pretty cool and an amazing testament of the power of Painter’s watercolor. I also loved the distant mountains. I decided to go back to a horizontal format and play a bit with the watercolor functions and a cityscape emerged. I do like the watercolor effects, but overall I thought this painting was a step backward. Going backward isn’t always a bad thing. I’m not sure what I was thinking, if anything, when I did the next piece, Landscape House. I wasn’t thinking about a house. I liked the landscape, but the few lines indicating a house or structure were an afterthought. I don’t know, but the afterthought seemed to work better this time. Karen Bonaker had sent me some paper textures, and I place one on Landscape House. I do like the way the paper looks. For me, something seemed to click with this Landscape House. But…then I had another step backward. In the next image, I tried to repeat some of the bold brush work, but again, I added a lonely tree and bush, which didn’t work. Will I ever learn? OK…so I am thinking I need simple, bold brush work and very little added details. I actually liked the next attempt. I am beginning to think I am heading in the right direction. I had a lot of help getting there. I would be remiss if I didn’t tell you that I am taking Tim Shelbourne’s Winter School, which is fabulous BTW. Anyway, I decided to post some of this work at the school, which was very hard for me to do. I am always nervous to post…even here on my blog. But, the students at the school were so encouraging and helpful. They told me what they saw in the work and pushed me forward. I started feeling more confident, which is always a plus. Unfortunately, the next image seemed a little forced to me…not very spontaneous. Mountain Trees 2 has some nice parts, but I think I was trying to hard with the main trees. So next, I just splashed paint and didn’t try to make a landscape at all. For fun, I threw in a splash of color. I do not know why I like this image, but I do. I intended to do more with it…but for some reason I just stopped…probably because I didn’t know what else to do with the image, which is always a good indicator that it is time to stop. When I introduced color to Abstract Landscape, it was like a breath of fresh air. I decided I needed a color break…and did a digital wet watercolor I call The Wet Arrangement. It is definitely a riot of color and I do like the painting very much. It is funny, but my favorite parts are the three places where the image leaves the picture frame. The two flowers and leaf were fairly representational, but I thought they needed to be less so. Using a very wet brush, just like adding water to a traditional watercolor painting, I brushed the flowers and leaf causing them to disperse. I love watching that happen in Corel Painter 2015. I think I needed the color break because the next two landscapes pleased me. I saw a direction; I saw me influenced by Gao Xingjian, but remaining me. The color break brought the touch of a warm color to The Lonely Hill. I liked that very much. I continued with the same concept in the next vertical piece. The green might be a little much especially in the signature. I still like this piece very much. Yesterday, I went back to a more traditional style. I do love working with quick brush strokes creating objects. There you have it, dear Reader. You know what I am doing. I will continue working this way for a little while longer, and then I will produce some “how to” videos and provide some brushes, too. I may even have a paper or two to share. This entry was posted in 2014 Corel Painter Posts and tagged Chinese Brush Work, Corel Painter 2015, Digital Ink Wash, Digital Watercolor, Skip Allen, sumi-e. Bookmark the permalink. These are so beautiful Skip – you always amaze and delight…. Thank you so much Rich…you are a kind and loving spirit. I love your posts, too. You’ve been busy with a lot of very creative things. I still like a lot of color so my favorite is the colored flowers. I agree, I like the ones going off the page. That is something I keep trying to convince my self to do, but I still struggle with it. Happy Holidays! Hey Judy!!! Thanks for commenting. Some folks say you should never go off the page. 🙂 Have a Merry and a Happy! Thanks so much for sharing again and again. These are really nice fresh little paintings. I like what you said about doing a lot of paintings and that some are successful and some are not. Me too skip. 🙂 I love to keep learning. I think you do too. I come from a traditional painting background but am pretty much digital in painter now. I love it. You are too hard on yourself, Skip. I loved this blog and your commentary about your progress. You have some beautiful paintings and I thank you for sharing them with us. Thanks Sally. Yep, I am hard on myself, but I don’t fret over it. 🙂 I have been known to say, “Self, get over yourself!” I did like some of the work, but not all. I think that is OK.
Wow! You certainly were in the flow. I like all of them, but the simpler ones are my favorite. I know you said you didn’t want to get into a debate about traditional and digital, but I can resist saying, as someone who lived in Japan as a child and studied with a Japanese sensei, the act of grinding the inks, loading and the holding the brush were an important part of sumi painting. Much like painting your wonderful pottery, the tactile aspect is part of the process. However, now that I am rarely able go to my studio, the computer is a fun substitution. Great post. Love seeing your art again! Awe Eva, no you didn’t. You started the debate. 🙂 Just kidding, you just echoed why there doesn’t need to be a debate. Traditional Sumi-e is what it is with all the wonderful trappings. Digital imagery is what it is with all of its wonderful trappings. Two very different animals. You mention that the computer is a fun substitution since you rarely go to your studio. For me, the computer isn’t a substitution or a replacement for traditional work. The computer is simply another way for me to create. Everybody, if you haven’t already heard about it, Eva has a wonderful e-book called Dissolve it Resolve it 101, Create New Art with Citrasolv, which you can buy from Eva’s shop, The Creative Nudge. Check it out…folks are producing extraordinary work using her techniques. I just ordered mine. Can’t wait to give it a try. This is so much my interest Skip and I think these images are wonderful. I am starting to wander into the world of Chinese Painting in the real world (inspired more by the semi-e digital class of Karen’s). So I hope you’ll keep at this and perhaps do a class- unless you are already combining with Karen in February? Hey Lyn, Thank you so much. I am glad that you enjoy the images. I’m sure I will be around in Karen’s class, but not in an official capacity. In the first class, we used a lot of my brushes and I did demonstrate in one of the live sessions, but I don’t know if that is around any more. Looking forward to Karen’s class in February. Skip, It was great reading this and seeing your paintings! I’m looking forward to the video and any extras that you may have. Thanks Sharyn…I hope it will not be too long before I get something done. Read this in my email, some of the images got lost since there were no boundaries so I came here to look at them – beautiful work. The creative process is forward & backward and helps us find the painting we seek. I have been fascinated with Chinese brush work and was probably the last time I touched a paint brush. I look forward to seeing more of your sumi-e and hope you will create some papers and a class. Maybe by then I’ll be able to use Painter 2015 again, right now it won’t let me repair it or reinstall. Merry Christmas! Loved the work, Skip. Sometimes you get too close and focused and don’t really see the trees for the forest or vice versa. I didn’t see “busy” when you did on the first landscape. This is obviously a lot of trial and error, but your keen eye will pick up what you eventually want and solve the problem of getting it. Thanks so much for sharing and in doing so….teaching! Hey Scott, I was intrigued with the comments at TAQ because they were so varied in likes and dislikes. I may do more of these types of posts. I’m really enjoying the dialog. Thanks for making a comment. Dear Skip, I signed on to Tim’s Winter class only to find I have no time for it right now. Sigh, I feel very behind and tremendously impressed with what little I view. I have always loved your oriental bent and in your blog I was able to read and view your thinking and progression. You start out with a quick sketch testing brushes and I fell in love with the simplicity and beauty of your strokes. I love the energy and visual excitement of the second. The third is so fluid with beautiful washes and line. I think I agree with you about the tree. Do you use layers? So much about the fourth that is appealing to me including the chop, even the bamboo leaves are beautifully rendered, but I still prefer the first three. Your critique of the fifth had me looking at the works of Gao Xingian. Tall dark tree didn’t work for me. I loved tall pine with mountain hint. Mmmm, the water color effect is so gorgeous. I continued to follow along my senses and curiosity piqued. And then you added color. . . scintillating. Your floral arrangement in color has so much fresh and immediate skill and joy. Yes, I love this one. Still you are on a journey, and one that I am enjoying every step of the way. Then there is lonely hill. For me this puts it altogether. You are a master. And then I view Tulips Maybe, and I say This puts it altogether! You are a master! For me this sings. I don’t even want to use words. Words will not do justice to the soul of this painting. Thank you for sharing, your work your soul, and leaving yourself so open and vulnerable. Joyce Davis who is still totally involved right now with training and competing in field and obedience and agility with her amazing Golden retriever Caper,(also putting on a seminar and an obedience trial). Your blog was a lovely respite for me. My gosh Joyce, forget painting, let’s talk Goldens. Quite a number of years ago, I got my first golden from a backyard breeder. He wasn’t the most beautiful dog, but he was my one in a million. He lived to just shy of 16. I didn’t know the first thing about puppies, but decided that I wanted Golden puppies so I got an little girl for him. Unfortunately, either he was past his prime or she just wasn’t interested. I had a friend who lived in Texas, so I drove to see her and breed my little girl. Can you see how dumb I was about this whole thing. Nothing happened so I took her to a vet who told me about a dog show that was currently in town. Maybe I could find a stud for her there, right? You can imagine the response I got…I even have to chuckle at my naivety. But, I did make friends with several breeders. One finally decided to trust that I would finish a pup and she was my first “fancy” golden. She was my second one in a million dog…beautiful and had more personality that I thought was possible. I did get her championship as promised. Also promised was to have two litters, which we did. I loved those puppies. I did keep some…at one time I had six goldens, but unfortunately my champion died young from cancer. I did a lot of research and found out her line, one of the best around, was riddled with cancer. I was devastated. I neutered everyone. I couldn’t continue to pass on that heartache to others. I have been without a golden for a number of years and I sorely miss having one. There is something so special about them. In the meantime I have had a number of rescues…cats and dogs. We also have a 35 year old African Gray Parrot. I still miss my goldens. I have told myself, that next year will be the year of a golden or two. Of course I want a puppy, but I may go the rescue route. See…we have lots in common. Good luck with your obedience and agility trials. I know you will have a blast. Thank you Winifred…I told you I was painting a lot. Great to read your creative process, Skip. You know how to focus, and with Painter, that is critical to getting anything done. I have bought an Epson R3000 so I can print my work, and that will present me with a whole new batch of challenges, but it will also mean I begin focussing my creative style and catalysing a workflow. Your post has taught me that (grim) determination is a good thing. Your work is always interesting to look at. Keep it up. Thanks Wardie. I sort of envy your new printer. I don’t have one and never print. I used to when I first started painting, but I wasn’t trying to sell anything and there are only so many friends I could give the prints to…;) I wound up with stacks of the things. Every now and then, I think I may want to print again, but luckily the urge passes. Although, I do have more friends now…so it might be easier to get rid of the things. Hope all is well down under. I do envy that you are getting into summer there…although where you live it is probably wonderful all year. We are starting winter here…sigh. But, since I live in the south winter will not last very long. I am just getting started again with artwork. Thanks. I juist got painter15 installed on my early holiday surface pro3 for myself. I would really enjoy some links for 15 items. Hey Mark, I have Painter 2015 on a Surface Pro 3, too. It is great fun. I am just learning how to turn the Surface Pro 3 into an Android, which will allow me to play with the new Painter mobile app on that machine. I have played with it a bit on my phone, but it is too little for me. What sort of links are you wanting? If you are talking about brushes, I have a ton on the site. With Painter, brushes are forward compatible, meaning that if I have posted brushes made for Painter 11, 12. or X3, they will work with Corel Painter 2015. Let me know what you had in mind when you asked for links and I’ll see what I can find for you. Thank you Skip. You are indeed an inspiration! I love your approach to viewing how inner thoughts are felt and shown. This was beautiful! Thank you Alice, your comment is very special. Love them all Skip: my fav is Lonely Hill !!! If I ever get the chance to visit Asia, I am going to call you for guidance. I love your descriptions of living in Asia. Hello Skip Your work looks really great! Thank you for sharing your process of exploration and experimentation with us! I wrote a lovely long comment on your WordPress blog, but then lost all of my comment when I tried to log into my WordPress account to send the comment. I don’t have time to type it all over again. Darn! However, I basically said that colour is a great addition to the Chinese paintings, and has been a trend among more contemporary Chinese artists for a few decades now. I am sure that you can research this online somewhere, if you wanted to check. Best wishes, Pamela in Ontario, Canada Email – pamelarichardson8@yahoo.ca Personal message – Please advocate for environment protection and social justice in your community. Our lives depend on it. Thanks for the info about color in contemporary work. I will do some searches. Sounds exciting. Very inspiring to look at, great technique. These paintings are absolutely fantastic. Thank you so much for sharing! It might be easy for some folks…but not me. I am glad it isn’t. I think I would get bored if it was easy. Thanks for leaving a comment. Thanks Jack, I hope to get to them soon. I love your ideas and painting, how we always try something new and how to get there!! Always reinventing ourselves ! Keep going , you give us hope when things don’t turn out the way we want!! Thanks Maureen…yep got to keep going…that’s the fun right! Skip, I follow you (very quietly :-)), but I just wanted to say thank you for taking the time to write this post. I loved it, and better yet, learned from it. Please keep it coming! Thank you Jackie, I appreciate your post more than you know. Good to see it’s not as easy for you as it looks while watching you just put down though beautiful marks and blobs. It’s also so hard to know when you’ve gone too far. Thanks for sharing your self with us. Thanks Ed…I go too far all the time, but that can be helpful, too. Thanks for the comment. I promise to keep sharing. Thank you for being brave enough to share! Lovely work! I always look forward to seeing what you’re doing, and eagerly anticipate your video. Overall, I like all of the pieces. They’re quite varied and expressive, and it’s fascinating to see the progression. I like your style and am striving for a similar kind of look in my work. You inspire me to keep plugging along. You achieve results from Painter that I didn’t know were possible. Thank you for your generosity. Thanks Paul. I am surprised all the time and what is possible in Painter. It is a very powerful and rich program…and fun, too. Your artwork is beautiful, as always! Enjoyed the blog! Nice to hear from you. The education version is a full version, however, it does not come with support nor is it upgradeable. You can buy the full version, but there is no upgrade option open to folks who bought the education version. If you are still a student, you can buy the educational version of 2015. But if you do buy the education version, just remember, it does not come with support, it is not upgradeable, nor may you use if for commercial reasons (sell work you created using it). It is still a sweet deal for students at $99.00. OK, that is my understanding of the rules, but it is best if you call Corel Sales and ask them about it. There may be some deal I am unaware of…I know there have been several sales of late that have been amazing. Thank you for sharing your creative process…inspiring and insightful. You truly help me to see that Corel’s promise of realizing “natural looking paintings” with digital media is indeed possible!! I’m most drawn to your work/techniques using papers and flow maps – that being said, II especially like your The City, Lonely Hill, and Forest Peak paintings. I’ve watch Netflix’s Marco Polo series and every time the title sequence plays, I always think of you and your interest in Chinese ink painting. You may wish to see of what I speak http://www.themillblog.com/2014/12/behind-the-work-marco-polo-title-sequence/ – it truly is quite stunning to watch!!! Thank you, Skip, for all that you do for the Painter community!!! Thank you Marie! Several folks have mentioned the Marco Polo lead in…and I agree it is beautiful. Amazing what they do. love this stuff. I checked out the site of the artist/writer. wonder if his books are in English. Can’t read french like i used to. 1. I have x3 and x. but didn’t do much with X. My problem is, I am overwhelmed by whats out there and i have no idea where a true beginner should begin. I downloaded the pdf, but dry. Any ideas anyone? 2. are you an RV geek? silly question i know. Sorry for the delay. There is a class at the Digital Art Academy that may be just right for you. It is PDF based, but Elaina covers the material in detail. I think the X3 class is still available and I know there is one for 2015. We don’t start back until January 3rd. but you could register then if you think you might like the class. Nope, not an RV geek, but always wanted one…would love to travel around lots. I suspect Xingjian’s books have been translated into English. Try Amazon…they seem to have everything. Hi Skip, I just looked at your fantastic sumi-e paintings and felt they were so evocative. I particularly liked the cityscape and the flowers – they just popped out of the background with so much life and beauty. 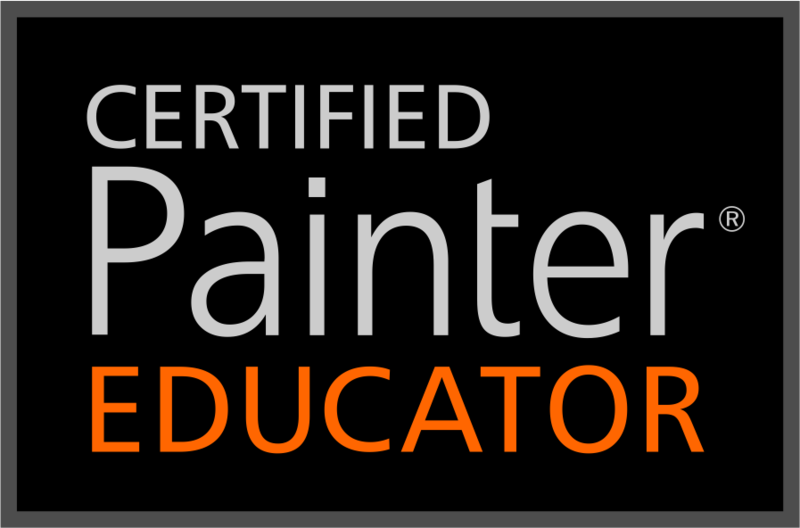 It truly inspires me to continue my learning process with Painter. I am so glad that you liked the sumi-e paintings. I have had a number of comments about cityscape via private email. Thanks for taking the time to make a comment.